Qosina offers an extensive line of luer-activated valves in a variety of configurations that are in stock and ready for immediate delivery. Ideal for use in flushing, sampling and IV applications, Qosina part #80213 is a swabbable, needleless injection site equipped with a male luer lock connector. 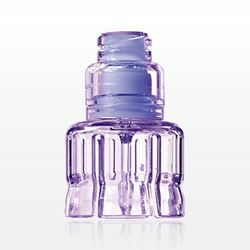 Made of tinted polycarbonate and silicone, this luer-activated valve is opened by the stem of a male luer. Once connected to the female luer lock, the valve is open, allowing for flow of fluids. Our sales team can assist you in building a custom configuration to meet your project requirements. Qosina offers an extensive line of luer-activated valves in a variety of configurations that are in stock and ready for immediate delivery. Ideal for use in flushing, sampling and IV applications, Qosina part #80214 is a needleless access Y connector with tubing ports that accommodates 0.16 inch ID tubing, and a luer-activated valve. Made of tinted polycarbonate and silicone, this swabbable luer-activated valve is opened by the stem of a male luer. Once connected, the valve is open, allowing for flow of fluids. Our sales team can assist you in building a custom configuration to meet your project requirements. Qosina offers an extensive line of luer-activated valves in a variety of configurations that are in stock and ready for immediate delivery. Ideal for use in flushing, sampling and IV applications, Qosina part #99777 is a 4-way stopcock with a white handle that features a female luer lock, a swabbable luer-activated valve and a male luer with spin lock. Made of tinted polycarbonate, HDPE, acrylic and silicone, this stopcock's luer-activated valve is opened by the stem of a male luer. Once connected, the valve is open, allowing for flow of fluids. Our sales team can assist you in building a custom configuration to meet your project requirements. Qosina offers an extensive line of luer-activated valves in a variety of configurations that are in stock and ready for immediate delivery. Ideal for use in flushing, sampling and IV applications, Qosina part #17629 is a needleless access T connector that features a female luer lock, a tubing port that accommodates a 0.143 inch OD tube, and a luer-activated valve. 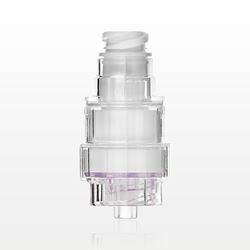 With a tinted polycarbonate housing and silicone valve, this swabbable injection site is opened by the stem of a male luer. Once connected, the valve is open, allowing for flow of fluids. Our sales team can assist you in building a custom configuration to meet your project requirements. Qosina offers an extensive line of luer-activated valves in a variety of configurations that are in stock and ready for immediate delivery. Ideal for use in flushing, sampling and IV applications, Qosina part #91041 is a needleless access Y connector with tubing ports that accommodates 0.145 inch ID tubing, and a luer activated valve. Made of polycarbonate, silicone and stainless steel, this luer-activated valve is opened by the stem of a male luer. Once connected, the valve is open, allowing for flow of fluids. Our sales team can assist you in building a custom configuration to meet your project requirements. Qosina offers an extensive line of luer-activated valves in a variety of configurations that are in stock and ready for immediate delivery. Ideal for use in flushing, sampling and IV applications, Qosina part #91042 is a needleless injection site that features a male luer lock connector. Made of polycarbonate, silicone and stainless steel, this luer-activated valve is opened by the stem of a male luer. Once connected, the valve is open, allowing for flow of fluids. Our sales team can assist you in building a custom configuration to meet your project requirements. Qosina offers an extensive line of luer-activated valves in a variety of configurations that are in stock and ready for immediate delivery. Ideal for use in flushing, sampling and IV applications, Qosina part #80147 is a swabbable, needleless injection site equipped with a male luer lock connector. Made of tinted polycarbonate and silicone, this luer-activated valve is opened by the stem of a male luer. Once connected to the female luer lock, the valve is open, allowing for flow of fluids. Our sales team can assist you in building a custom configuration to meet your project requirements. Qosina offers an extensive line of luer-activated valves in a variety of configurations that are in stock and ready for immediate delivery. Ideal for use in flushing, sampling and IV applications, Qosina part #80162 is a swabbable, needleless injection site equipped with a 0.078 inch ID tubing port. 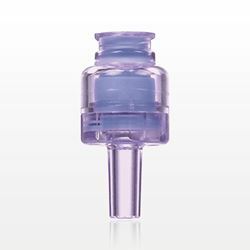 Made of tinted polycarbonate and silicone, this luer-activated valve is opened by the stem of a male luer. Once connected to the female luer lock, the valve is open, allowing for flow of fluids. Our sales team can assist you in building a custom configuration to meet your project requirements. Qosina offers an extensive line of luer-activated valves in a variety of configurations that are in stock and ready for immediate delivery. Ideal for use in flushing, sampling and IV applications, Qosina part #80163 is a swabbable, needleless injection site equipped with a 0.098 inch ID tubing port. Made of tinted polycarbonate and silicone, this luer-activated valve is opened by the stem of a male luer. Once connected to the female luer lock, the valve is open, allowing for flow of fluids. Our sales team can assist you in building a custom configuration to meet your project requirements. Qosina offers an extensive line of luer-activated valves in a variety of configurations that are in stock and ready for immediate delivery. Ideal for use in flushing, sampling and IV applications, Qosina part #80164 is a swabbable, needleless injection site equipped with a 0.11 inch ID tubing port. Made of tinted polycarbonate and silicone, this luer-activated valve is opened by the stem of a male luer. Once connected to the female luer lock, the valve is open, allowing for flow of fluids. Our sales team can assist you in building a custom configuration to meet your project requirements. Qosina offers an extensive line of luer-activated valves in a variety of configurations that are in stock and ready for immediate delivery. Ideal for use in flushing, sampling and IV applications, Qosina part #80165 is a swabbable, needleless injection site equipped with a 0.145 inch ID tubing port. Made of tinted polycarbonate and silicone, this luer-activated valve is opened by the stem of a male luer. Once connected to the female luer lock, the valve is open, allowing for flow of fluids. Our sales team can assist you in building a custom configuration to meet your project requirements. Qosina offers an extensive line of luer-activated valves in a variety of configurations that are in stock and ready for immediate delivery. Ideal for use in flushing, sampling and IV applications, Qosina part #80166 is a swabbable, needleless injection site equipped with a 0.16 inch ID tubing port. Made of tinted polycarbonate and silicone, this luer-activated valve is opened by the stem of a male luer. Once connected to the female luer lock, the valve is open, allowing for flow of fluids. Our sales team can assist you in building a custom configuration to meet your project requirements. Qosina offers an extensive line of luer-activated valves in a variety of configurations that are in stock and ready for immediate delivery. Ideal for use in flushing, sampling and IV applications, Qosina part #80168 is a swabbable, needleless injection site equipped with a 0.160 inch ID by 0.27 inch OD tubing port. 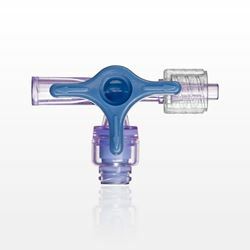 Made of tinted polycarbonate and silicone, this luer-activated valve is opened by the stem of a male luer. Once connected to the female luer lock, the valve is open, allowing for flow of fluids. Our sales team can assist you in building a custom configuration to meet your project requirements. Qosina offers an extensive line of luer-activated valves in a variety of configurations that are in stock and ready for immediate delivery. Ideal for use in flushing, sampling and IV applications, Qosina part #80152 is a swabbable, needleless injection site equipped with a 0.118 inch ID tubing port. Made of tinted polycarbonate and silicone, this luer-activated valve is opened by the stem of a male luer. Once connected to the female luer lock, the valve is open, allowing for flow of fluids. Our sales team can assist you in building a custom configuration to meet your project requirements. Qosina offers an extensive line of luer-activated valves in a variety of configurations that are in stock and ready for immediate delivery. 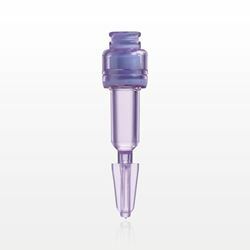 Ideal for use in applications that require a needle-free fluid transfer from a vial, Qosina part #80220 is a 13 mm vial adapter that is equipped with a needleless injection site. Made of tinted polycarbonate and silicone, this swabbable luer-activated valve is opened by the stem of a male luer. Once connected, the valve is open, allowing for flow of fluids. Our sales team can assist you in building a custom configuration to meet your project requirements. Qosina offers an extensive line of luer-activated valves in a variety of configurations that are in stock and ready for immediate delivery. Ideal for use in flushing, sampling and IV applications, Qosina part #80167 is a swabbable, needleless injection site equipped with a female luer lock and male luer slip. Made of tinted polycarbonate and silicone, this luer-activated valve is opened by the stem of a male luer. Once connected to the female luer lock, the valve is open, allowing for flow of fluids. Our sales team can assist you in building a custom configuration to meet your project requirements. The needleless injection site features neutral displacement preventing backflow upon disconnection of a luer and is equipped with 300 PSI back pressure when activated. The non-disconnect male luer lock provides a non-removable connection eliminating the need for bonding and a swabbable luer activated female luer lock allows for aspiration or injection. Qosina offers an extensive line of luer-activated valves in a variety of configurations that are in stock and ready for immediate delivery. Ideal for use in flushing, sampling and IV applications, Qosina part #80169 is a swabbable, needleless injection site equipped with a break-off tip that can be used with bags that have 0.236 inch ID ports. Made of tinted polycarbonate and silicone, this luer-activated valve is opened by the stem of a male luer. Once connected to the female luer lock, the valve is open, allowing for flow of fluids. Our sales team can assist you in building a custom configuration to meet your project requirements. Qosina offers an extensive line of luer-activated valves in a variety of configurations that are in stock and ready for immediate delivery. Ideal for use in flushing, sampling and IV applications, Qosina part #80170 is a swabbable, needleless injection site equipped with a break-off tip that can be used with bags that have 0.26 inch ID ports. 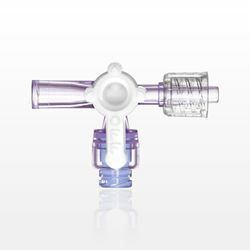 Made of tinted polycarbonate and silicone, this luer-activated valve is opened by the stem of a male luer. Once connected to the female luer lock, the valve is open, allowing for flow of fluids. Our sales team can assist you in building a custom configuration to meet your project requirements. Qosina offers an extensive line of luer-activated valves in a variety of configurations that are in stock and ready for immediate delivery. Ideal for use in flushing, sampling and bloodline applications, Qosina part #80132 is a needleless injection site that accommodates 0.268 inch OD tubing, and features a blue swabbable injection site. With a tinted polycarbonate housing and silicone valve, this swabbable valve is opened by the stem of a male luer. Once connected, the valve is open, allowing for flow of fluids. Our sales team can assist you in building a custom configuration to meet your project requirements. Qosina offers an extensive line of luer-activated valves in a variety of configurations that are in stock and ready for immediate delivery. Ideal for use in flushing, sampling and bloodline applications, Qosina part #80131 is a needleless injection site that accommodates 0.268 inch OD tubing, and features a red swabbable injection site. With a tinted polycarbonate housing and silicone valve, this swabbable valve is opened by the stem of a male luer. Once connected, the valve is open, allowing for flow of fluids. Our sales team can assist you in building a custom configuration to meet your project requirements.